It appears lots of people are unhappy with the Kickstarter delays so have voiced their frustration in the comments. This only happened today and reviews seem generally positive. Anyway was tempted to picked these up for the retail price of £139.99 but currently on a deal of the day for £56.24 so had to give them a try! There seems to be a lot of bad feeling towards this company in the reviews. It looks like it belongs to Anker which would also explain the promotion offering discount on Anker stuff. Shame if its true as Anker are good, strange to jeopardise its reputation by ripping people off. There seems to be a lot of bad feeling towards this company in the …There seems to be a lot of bad feeling towards this company in the reviews. It looks like it belongs to Anker which would also explain the promotion offering discount on Anker stuff.Shame if its true as Anker are good, strange to jeopardise its reputation by ripping people off. 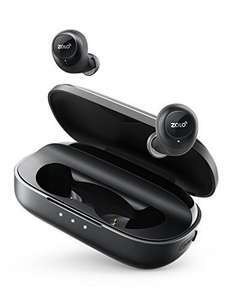 Essentially it looks like it was a partnership between Anker and ZOLO. They created a Kickstarter project for the slightly better + version but surpassed their goal by millions of dollars. While good for the companies it must have caused a logistical nightmare trying to get them produced and shipped out in time - around the Christmas period. All reviews I've read around the product itself seem really positive so I'm sure the headphones aren't the issue, just the delay people are facing with the + version they ordered from Kickstarter. I don't understand why people back kickstarter projects, then get in a huff when they don't deliver? There are so few projects that actually do as intended (see.sense being one that springs to mind). People want to pay kickstarter backer early bird products, but expect a timeline like a shop. Not how it works. I like the look of these, and did when I saw them ok KS originally, but knew it wouldn't be long before there was an Mpow branded version or similar on Amazon. Shame they're Micro USB. All of my chargers nowadays are USB-C, so I guess I'll have to wait for the next model. I don't understand why people back kickstarter projects, then get in a …I don't understand why people back kickstarter projects, then get in a huff when they don't deliver?There are so few projects that actually do as intended (see.sense being one that springs to mind).People want to pay kickstarter backer early bird products, but expect a timeline like a shop. Not how it works.I like the look of these, and did when I saw them ok KS originally, but knew it wouldn't be long before there was an Mpow branded version or similar on Amazon.Shame they're Micro USB. All of my chargers nowadays are USB-C, so I guess I'll have to wait for the next model. Well lets put it this way. If the kickstarter project said "delivery estimate: we don't have a clue" no one would back them. They gave estimates of October I believe. Some have received them. Some haven't. Then this model comes out of the woodwork, in stock. That is insulting to the kickstarter backers. Good ratings in that this product uses quality parts. However beware that, via the nature of singular wire free design, they get lost very easy, especially whilst exercising. The kickstarter one is a niche small production run. You are getting a better product there, if so, so I cannot see the fuss. The kickstarter one is a niche small production run.You are getting a …The kickstarter one is a niche small production run.You are getting a better product there, if so, so I cannot see the fuss. Would you tell me what's the diifference between the + and none +? Kindly note that it's the Liberty+ you backed the Kickstarter campaign. Liberty are the entry-level version of Liberty+. Like Liberty+ they are total wireless earphones with graphene-enhanced sound. However, they do not have several of the features which make Liberty+ special. These include super-extended battery life (Liberty+ 48 hours vs Liberty 24 hours), a premium aluminum charging case, transparency functionality, EQ adjustment via Zolo Life App, and other key innovations. If you have more questions, feel free to contact us at service@zoloaudio.com. Thank you. No idea really. They are possibly supplied with a bigger battery and the design looks to use an extra mid ear hook. Buyers are now miffed at not getting such a bargain, and not well in advance. I guess its like getting an iPhone on day one, them wanting to be the one to show them off to their mates. No idea really. They are possibly supplied with a bigger battery and the …No idea really. They are possibly supplied with a bigger battery and the design looks to use an extra mid ear hook.Buyers are now miffed at not getting such a bargain, and not well in advance.I guess its like getting an iPhone on day one, them wanting to be the one to show them off to their mates. They boast better battery life on the + model, but that's only the charging case. The earphones themselves still have poor battery life. Zolo asked me to wait an unspecified amount of time for them to implement Alexa functionality, then after an age of silence, decided they couldn't do it, so I requested a refund. Still waiting for that money. Incorrect m'lady. The kickstarter money for liberty+ was used to fuel the production and sale of liberty to the general public. Early adopters who had placed faith in the zolo idea to begin with now feel slightly betrayed by promises and claims made early on. Backers should have been prioritised and those earphones delivered first. Either way I'm happy to wait as I didn't pay much more to get the enhanced version. Backers got fooled into thinking the use of graphene for headphones was new and 'the best'. Incorrect m'lady. The kickstarter money for liberty+ was used to fuel the …Incorrect m'lady. The kickstarter money for liberty+ was used to fuel the production and sale of liberty to the general public. Early adopters who had placed faith in the zolo idea to begin with now feel slightly betrayed by promises and claims made early on. Backers should have been prioritised and those earphones delivered first. Either way I'm happy to wait as I didn't pay much more to get the enhanced version. Most people don't expect Kickstarter to act like a shop, so you're quite right in saying that you don't understand, but you're applying it to the wrong part of your comment. As someone who's actually backed quite a few projects, I can help you understand. The main thing that gets backers annoyed is a lack of communication, or non-updates. When Steadicam / Tiffen finished their product & shipped it out to shops instead of the backers who helped the product become a reality, we were all pretty annoyed. When other companies claimed to have a finished product during the Kickstarter / Indiegogo marketing campaign, then announce that they've not even finished a prototype after 6 months of them being funded, it gets people racked off. Only idiots expect a product to arrive without a delay, but basic communication isn't too much to ask for. Well, it is mainly a shop,it getting new products to peoples attention. Fact is, to be seen they still often need the same line of communication to get it to peoples attention. I think the Plus are Bluetooth 5 with quadrupled range, that aspect being the most likely delay.